Just to confirm the report by Zamba Bone. We played with the old deck and without Tactician cards. The initial French attack in the center was repelled by a British GTtCS. 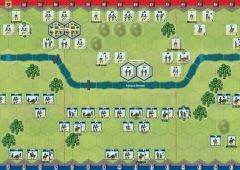 Then a masterfully executed attack by the French heavy cavalry created many troubles for the British on their right flank and earned three VP. A series of attack and counter-attack in the center tied the score 4-4. In the end, the British won thanks to a lucky roll that, for the second time in the game, eliminated a French leader. I realized I need to refresh a bit my knowledge of the rules. Zamba Bone played very competently and probably deserved to win. Dice did not agree. Last edit: 6 months 4 weeks ago by g1ul10. We played with the old deck and without Tactician cards. 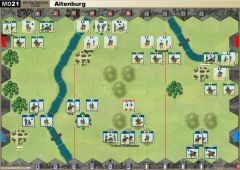 The British infantry tried to conquer the towns in the center while the French cavalry was ravaging their colleagues on the right. Once the French cavalry finished its slaughtering job, the French artillery took its place with a bombard and a fire and hold, that crippled the most advanced British units. A firefight followed on the hills in the center section. 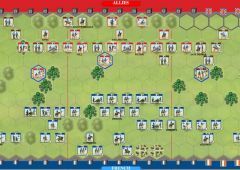 The British fought bravely, but the French units were simply too many. Confirmed. Yes, the Fire and Hold (Giulio actually had both of them), and the Bombard ravaged me, and my shots hardly hit anything. Forgot to reshuffle after playing Elan. Sechs Fuß hoch aufgeschossen, ein Kriegsgott anzuschaun, der Liebling der Genossen, der Abgott schöner Fraun. Blauäugig, blond, verwegen, und in der jungen Hand, den alten Preußendegen – Prinz Louis Ferdinand. Wow. What a baptism of (competitive) fire for me. Two really fun battles between Kandras and myself. Spectacular and bloody battle. 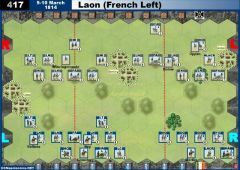 The French army took the initiative and pushed hard on both flanks. 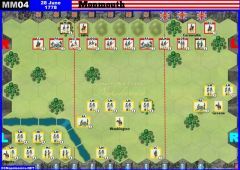 The British proved capable tacticians on their right side and withstood the ferocious cavalry charge. 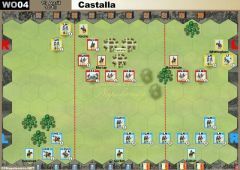 On the French right, vicious fighting took place over Piedralonge with one British Light Infantry regiment holding out for a large number of turns. Still, eventually, the French were victorious on their right section and continued a methodical roll-up of the British position on the crest from the right and the centre-right. Clever use of La Grande Maneuvre brought the French artillery into the close-range fray and the British were battered into submission. Very well-fought battle with Kandras giving me a mastercalss in the value of a methodical, deliberate and supported assault (with just enough action in other sections so as to keep me busy and on the back foot throughout the confrontation). Contrary to the first battle, the second bout was initiated in the centre rather than on the flanks. The French sought to make the most out of high-maneuverability cards with which to claim the central hill formation. 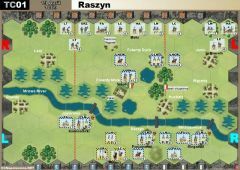 However, the British countered calmly and efficiently, bringing the Guard Grenadiers to the front with a sneaky "Call Forward Reserves" early on. 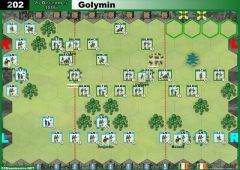 The French claimed two victory banners (including beating the British Guard Grenadiers in a single, ferocious Combined Arms assault), but were beaten back. A lull ensued and the French pulled back from their ill-advised and unsupported central charge. Instead, they committed troops on both flanks and expanded the field of engagement. Piedralonge was claimed and the British right severely weakened. Subsequently, the French dragoons charged forward, forcing the British riflemen into square (but their Breaking the Square was somewhat of a disappointment) and audaciously charging the British artillery battery across the stream. 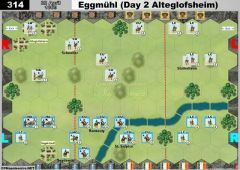 Eventually, the artillery unit was destroyed and the French troopers charged the Light Cavalry on the edge of the battlefield. 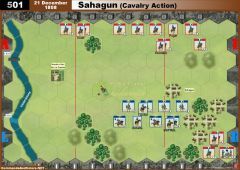 The British general tried to trap the French cavalry but was unsuccessful (although the riflemen scored a remarkable long-range kill on the second cavalry unit). 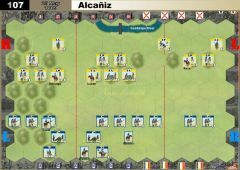 The British cavalry was routed off the battlefield and the French scored the final banner on their right, dispatching the last remaining British unit in that sector. Thanks a million to Andras for two exciting battles that were great fun as well as a great learning experience for me personally. In the second battle, I really felt that I had useful cards during most of the battle and my units were (dice roll) resilient when they most needed to be. That proved decisive (I thought I'd be clobbered after I bungled my early central attack). It was tight and exciting (as the margin clearly shows) and even though we had a few Java/Vassal hiccups, Andras was a terrific opponent throughout. The Java problem resulted in my missing the final two thirds of the second battle in my logfile. So I have uploaded the save game file instead. For the record I have to admit Stan was playing confidently throughout the whole game during our 2 match. He indeed out-smarted and outmanoeuvred me in every aspect, no wonder he was supported by lucky dice. My indecisive Allied counter-attack and the many positioning errors slowly but inevitably lead to a convincing and well deserved Blue victory. Hail to the Victor! 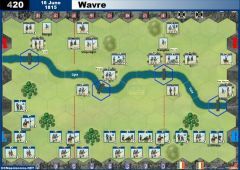 Two tough fought battles, both saw the French cavalry us a break the square to take control of the left. Sharp clashes on the right, but in both battles the center was the deciding factor. Did anybody hear anything from Kutuzov or Christhibolt, looking to their profile neither of them logged in in the last 6 weeks or so. Just heard from Tom (Kutuzov) and Chris is a veteran player. So just poor comms.